Over the past few years, General Cigar Company has put a focus on its Cohiba brand. 2017 was no exception, as the company brought in a new brand ambassador in Sean Williams, and introduced a new line known as Cohiba Blue. Over the years, Cohiba has been positioned as an ultra-premium brand within the General Cigar company portfolio. With Cohiba Blue, General takes a bit of a different spin as it is positioned as “inclusive luxury” – in other words bringing in a more affordable price point that can act as a gateway into the Cohiba brand. Cohiba Blue comes in at a price point between $8.99 to $10.99 – aggressively priced compared to the other Cohiba offerings. Today, we take a closer look at the Cohiba Blue in the Robusto size. The reason for the Blue name is pretty obvious, as the packaging features plenty of blue. While the coloring is definitely striking, the Cohiba Blue has a simplistic packaging design. It uses simple blue colored bands and blue painted cedar boxes. 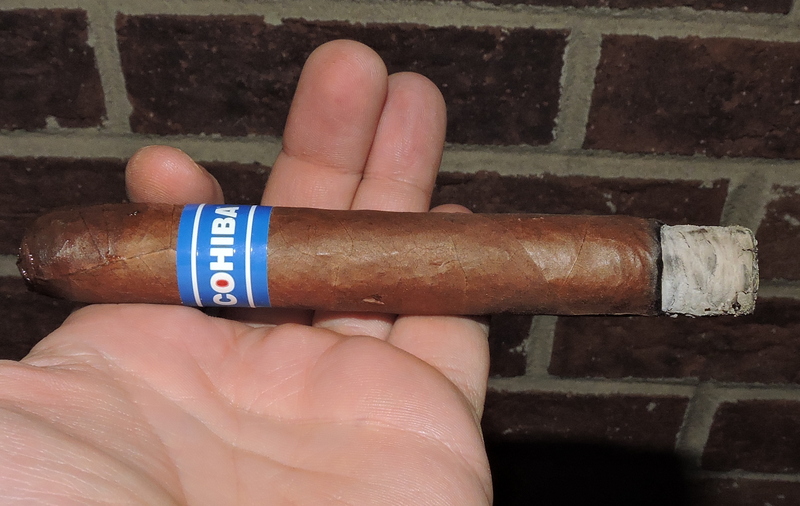 Without further ado, let’s take a look at the Cohiba Blue Robusto and see what this cigar brings to the table. 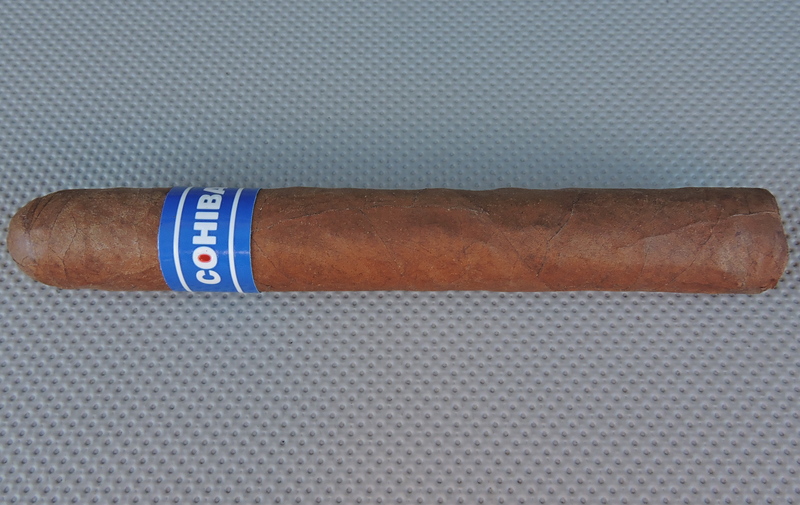 Cohiba Blue utilizes a Honduran wrapper from the Olancho San Agustin region – sometimes called an OSA wrapper. The OSA wrapper is something that was first introduced in 2011 with the CAO OSA Sol , however it has been something it has now been incorporating in other brands over the past year – including the Toraño Exodus and the recently released Partagas Heritage. What makes Cohiba Blue different is that it uses the OSA leaf for the binder as well. 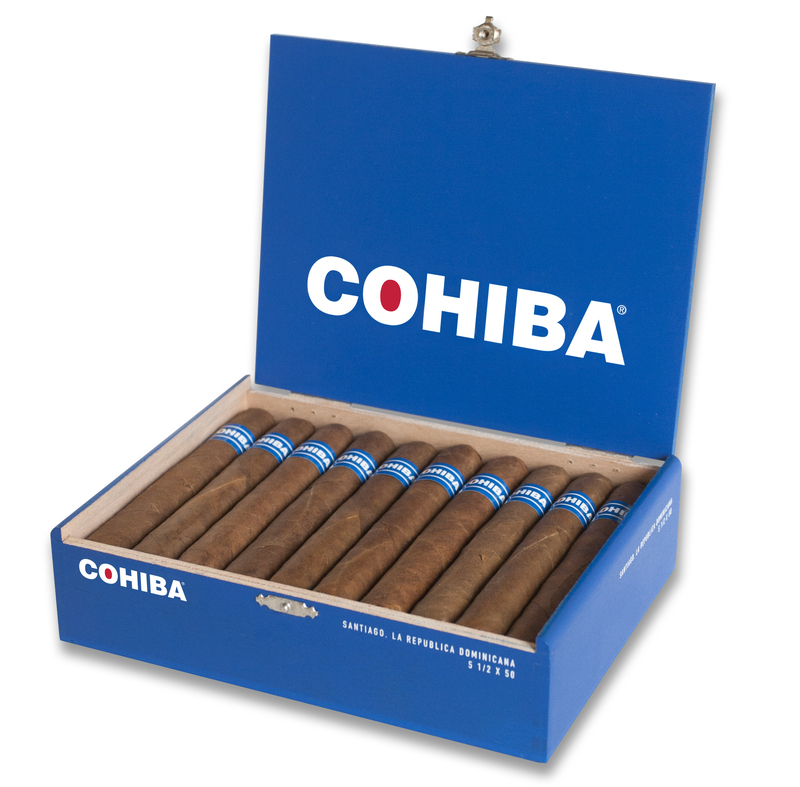 There are four sizes of the Cohiba Blue. Each are packaged in 20 count boxes. The Honduran OSA wrapper of the Cohiba Blue Robusto had a rosado Tinto to it. There was a light coating of oil on the surface of the wrapper. This was a bumpy wrapper. There were some visible veins and at certain points the surface of the wrapper was toothy. In addition, there were also some visible wrapper seams. As discussed the band is blue in color. Prominently displayed on the center of the band is the text “COHIBA” in white font with a Cohiba “red dot” inside the “O”. Near the top and bottom of the band is a thick white stripe. There is also an additional Cohiba “red dot” toward the far right of the band. Prior to lighting up the Cohiba Blue Robusto, I went with with a straight cut to remove the cap. After successfully removing the cap, it was on to the pre-light draw phase. The dry draw delivered a mix of subtle earth, natural tobacco, and wood notes. Overall I considered the pre-light draw of this cigar to be satisfactory. At this point I was ready to light up the Cohiba Blue Robusto and await what the smoking phase would deliver. The Cohiba Blue Robusto started out with what I would describe as “creamy earth notes”. In the background were some notes of natural tobacco and white pepper which layered a nice balance of sweetness and spice. Meanwhile there was an additional layer of white pepper on the retro-hale. Midway through the first third, a cedar note emerged in the background. By the end of the first third, the cedar along with the natural tobacco and pepper notes began to increase. This continued throughout the second third. By the second half, the combination of the natural tobacco, cedar, and pepper eclipsed the creamy earth notes which had be dominant thus far. The final third of the Cohiba Blue Robusto saw the cedar and pepper notes in the forefront. The natural tobacco sweetness had now receded into the background and the creamy earth notes dissipated. While there was some spice in the forefront, it never got overpowering. This is the way the cigar experience of the Cohiba Blue Robusto came to a close. The resulting nub was cool in temperature, but slightly soft to the touch. For the most part the Cohiba Blue Robusto maintained a straight burn path and had a straight burn line. At times the ash was quite firm and other times less firm. The ash itself had a light gray color. Meanwhile, the Cohiba Blue Robusto maintained an ideal burn rate and ideal burn temperature. The draw to the Cohiba Blue Robusto was on the snug side. While I normally do like a little resistance on the draw, in this case, the draw had crossed the threshold and it required a little more work than I prefer. While it was a snug draw, I never found this cigar to be plugged and the cigar never needed a total re-light. Overall, the Cohiba Blue Robusto is on the dialed-back side. I found this cigar to start out in the mild to medium range for both strength and body. There was a gradual, linear increase in intensity for both attributes throughout the cigar experience. By the second third, the strength and body moved into medium territory. While the strength and body continued to gradually increase, the intensity level never moved out of the medium range of the spectrum. In terms of strength versus body, both attributes balanced each other very nicely with neither one overshadowing the other. Brand delineation is a big thing in my book – and recent experiences on Cigar Coop have shown confusion can happen when the lines are blurred. To me, Cohiba had a spot in the General portfolio as the luxury brand, and I really would have liked if that is where the brand stayed. In a nutshell, I’m not a 100% sold on making an affordable Cohiba with the new Cohiba Blue. That being said, in terms of assessing the cigar itself, the brand delineation plays no part in either the merit score or the value rating. In my assessment, the Cohiba Blue is a good cigar, but it doesn’t do much to stand out and “rise above the pack”. I know General prides itself on the OSA wrapper. While this is one of the better cigars I have had with it, I’m not 100% sold on it as I haven’t been wowed by any blend that uses it. It does have a unique taste, but I’m also not sure if it meshes with the Cohiba line. Still, this cigar had enough going on with it that I would recommend it to either a novice or experienced cigar enthusiast to try.